Finding the distance between fractions on number lines is fun with this unit! 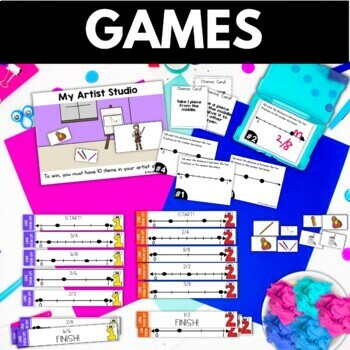 This product includes everything you need to help your students to find the distance between two fractions on a number line. There is a mini lesson on the distance between two fractions on a number line, fraction number line worksheets, fractions on a number line games and activities. This aligns with 3.NF.2. 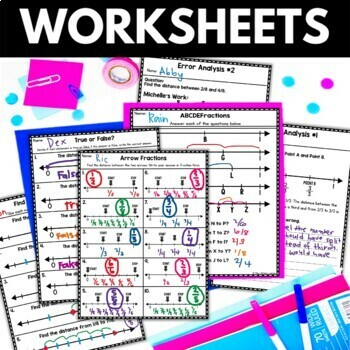 Click here to save 40% when you buy the 3rd Grade Fractions Bundle. 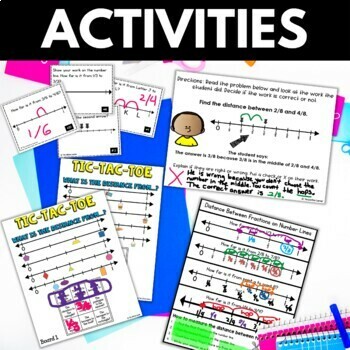 Click here to save 50% when you buy the bundle of 3rd Grade Math Units for the entire school year. This product was designed for third graders, but would work great for high second graders or as a review for fourth graders as well. 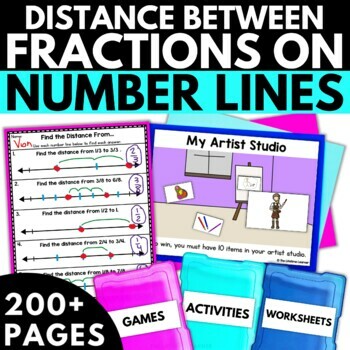 If you are looking for a product that focuses on just teaching students how to put fractions on the number line, check out my Fractions on the Number Line. This resource is like Part 2 of that one! Students learn in the mini-lesson how to find the distance between two fractions on the number line. In the eight worksheets included, students practice both putting fractions on the number line and finding the distance between two fractions. Students gain a deeper understanding of the distance between two points on a number line. There are 6 error-analysis writing prompts. Students look at sample problems and decide what the child did wrong in each problem. They then explain their thinking in the space provided and describe what the correct answer is. There are also 10 Tic-Tac-Toe Fraction game boards included. Students can play tic-tac-toe against a friend while practicing this important skill. In all, there are over 50 pages included in this product! Check out the preview to see more! Third Grade Fraction Unit BUNDLE! Looking for more Fraction Resources? -This is a room transformation that allows students to become pirates while learning about comparing fractions at the same time! -This is a room transformation that allows students to become detectives while learning about fractions at the same time! -This is a room transformation that allows students to become chefs while learning about equivalent fractions at the same time! -This is a room transformation that allows students to become farmers while learning about identifying fractions at the same time! -This is a room transformation that allows students to become race car drivers while learning about fractions on number lines at the same time! Also, follow me and be notified when new products are uploaded. New products are always 20% off for the first 24 hours they are posted. It pays to follow me! Purchasing this product grants permission for use by one teacher in his or her own classroom. If you intend to share with others, please purchase an additional license at a discount!